Alwaght– As the tensions are intensifying in the Yemeni cities held by the loyalists to the resigned President Abd Rabbuh Mansour Hadi and the Saudi-led Arab military coalition, the protests begin to spread wide in the south, with the protestors calling the Riyadh-led coalition a “sham coalition” and holding it accountable for the repeated attacks on civilians and the deteriorating situation across the south. Earlier, Abdulmalik al-Mekhlafi, the foreign minister of the resigned government had said that the disputes with the UAE were the key factors delaying Mansour Hadi’s return to Aden. This delay has last for three years, however. Over the past three years, in which the Saudi coalition’s attacks were unceasingly underway, Mansour Hadi’s Arab allies have claimed that they can very soon restore to power the resigned and fugitive president. But the Saudis have so far failed to materialize their promise. 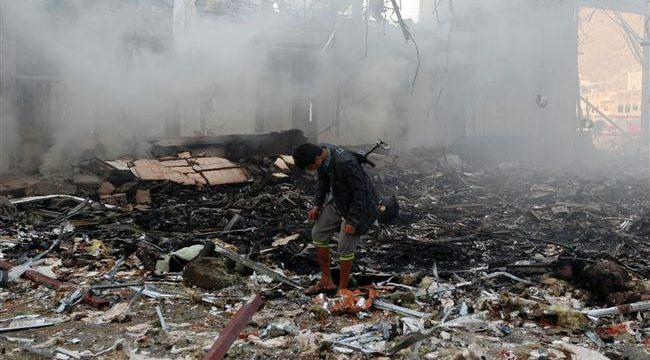 Mansour Hadi resigned and fled the country to neighboring Saudi Arabia short before a coalition of Arab states led by Riyadh started a devastating war against Yemen. Meanwhile, on the one hand the ongoing war and the consequent critical conditions and on the other hand the state of uncertainty resulting from the absence of an efficient government on the ground to get things right have aroused the southerners to protest the continuation of war and deem Mansour Hadi’s government illegitimate. In fact, the three-year uncertainty after three years of war has made the Yemenis of the south lose their patience with Saudi Arabia. Where do the protests take place? The demonstrations are taking place in two cities of Yemen that over the course of the past three years have experienced the biggest intervention of the Yemeni and Saudi forces. Taiz has been a contested city for which the Arab forces and the Yemeni army fought fiercely. Each side held it at least once. But now a large part of the city is held by the army forces and popular committees. A major part of the fresh demonstrations against the war has taken place in this city whose people called for an end to Saudi regime’s aggression. But unlike Taiz, a vast part of Aden port city is occupied by Saudi coalition. Although the Arab forces are heavily spread across the city, people arranged huge rallies to protest the Riyadh-recognized government and the continuation of the war. While the anti-government and occupation rallies unfold in the southern cities, reports are talking about widening gaps between the two aggressors Saudi Arabia and the UAE. Despite the fact that Riyadh and Abu Dhabi allied under a coalition and waged a war on Yemen, the two allies since the beginning were pursuing highly conflicting objectives. While the key war goal of Saudi Arabia was to bring back to rule the resigned Mansour Hadi, the UAE has concentrated on southern Yemen without paying much attention to the fate of the north. Since the beginning, Abu Dhabi was opposed to returning Mansour Hadi to power and instead favored seizure of power by the parties close to the former President Ali Abdullah Saleh. So far, disputes between the Saudis and the Emiratis have led them to an impasse about choosing an agreed-upon figure to lead Yemen. On the other side, Saudi Arabia finds the partition of Yemen posing a threat to its own interests, but the UAE has focused its supports on the southern separatists and is struggling to strengthen its toehold in the port city of Aden. The UAE ambitions have catalyzed a destructive Riyadh-Abu Dhabi competition which only makes situation in Yemen more complicated.